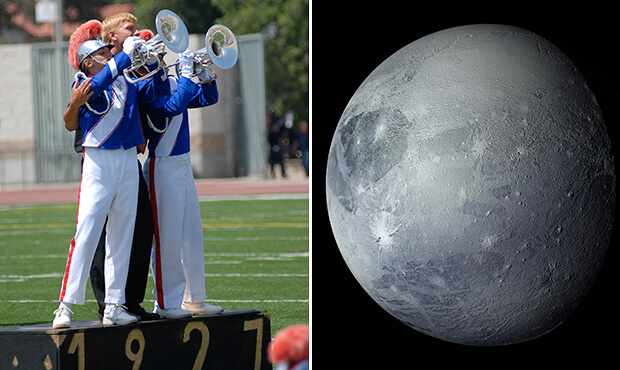 Which drum corps was founded before the discovery of the planet Pluto? How many candles were already on the Boston Crusaders' birthday cake when the first man walked on the Moon? The answers may amaze you. Drum Corps International has had a long and illustrious history since its founding in 1972, and even well before then, drum and bugle corps were performing as the world turned around them. 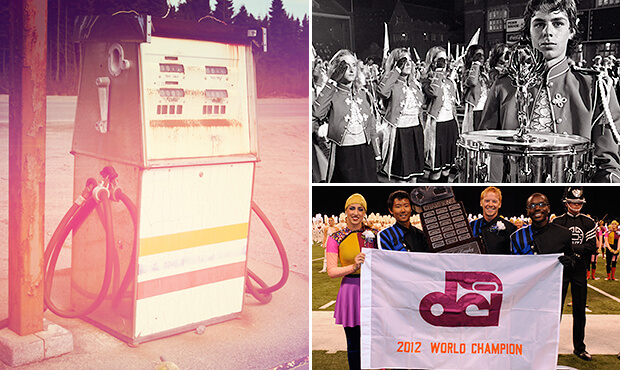 Tracing notable events over the timelines of DCI ensembles, from entertainment to politics to sporting events and more, we've compiled this list of 11 surprising facts that'll change the way you think about drum corps in a historical perspective. 1. The Racine Scouts were founded three years before the discovery of the planet Pluto. 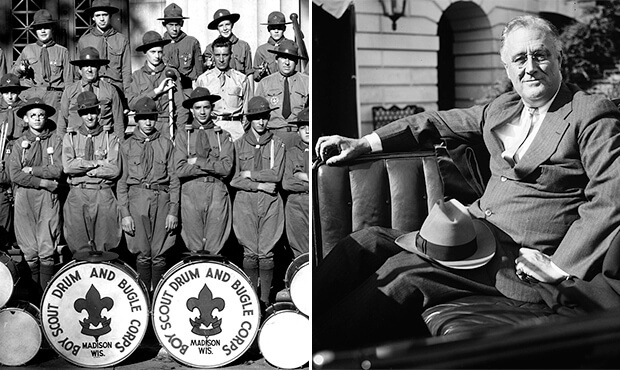 Founded in 1927, Racine Scouts is one of the oldest DCI drum corps today. Three years after the group organized as part of Boy Scout Troop 15 in Wisconsin, astronomer Clyde Tombaugh discovered what became known as Pluto. Originally classified as the ninth planet from the sun, in recent years Pluto has been downgraded to "dwarf planet," proven to be just one of a number of large icy bodies located billions of miles from Earth. 2. Florida drum corps Suncoast Sound performed its 1960s tribute show just two years after the Vietnam Veterans Memorial went up in Washington. Suncoast Sound tackled the turbulent 1960s as the subject matter of its 1984 competitive production. 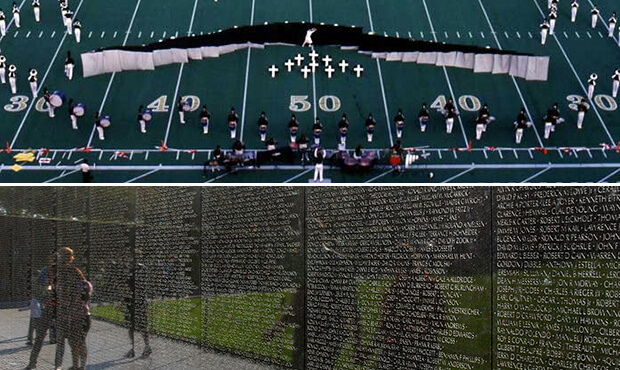 During a portion of the performance, the corps' color guard members erected 28 pieces of fabric from the ground to reveal the shape of the Vietnam Veterans Memorial. Ground was broken for the actual memorial in Washington, D.C. two years earlier in 1982. A 21-year-old Yale architecture student designed the monument which commemorates the names of more than 58,000 soldiers who were killed or missing in action during the war in Vietnam. 3. 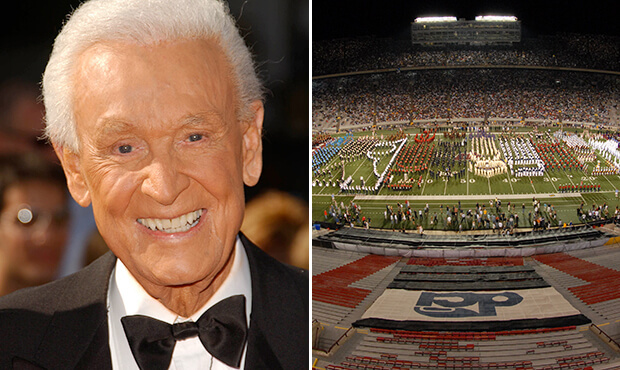 35 years of drum corps members performed while Bob Barker hosted the television game show, "The Price is Right." Less than a month after the very first DCI World Championship took place in Whitewater, Wis., television personality Bob Barker took the reins of the CBS game show "The Price is Right." Barker signed off from his final "Price is Right" broadcast in June of 2007, still kickin' at 84 years old. The final episode aired just a day before the '07 DCI Summer Tour got underway. 4. Franklin D. Roosevelt was the President of the United States when the Madison Scouts played their first note. Founded in 1938 by a group of Wisconsin businessmen, the Madison Scouts picked up their instruments for the first time while Franklin D. Roosevelt served his second of four terms as President of the United States. Just three years later under FDR's leadership, the U.S. found itself involved in WWII. Fast forward several decades: The Scouts last won the DCI World Championship in 1988, during which Ronald Reagan was serving the last year of his presidency. 5. 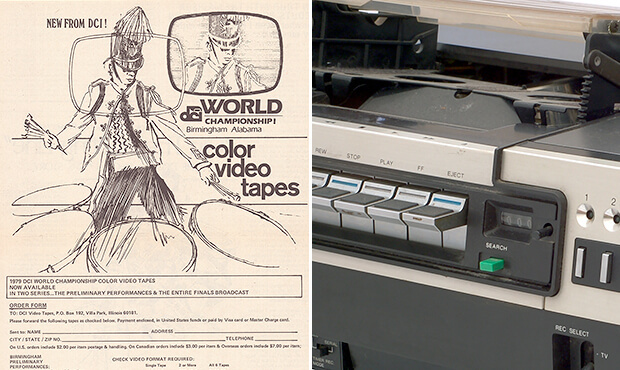 DCI held four World Championships before VHS videotapes became a household item. Long before DVDs and Blu-ray discs, the VCR ruled the home video market. Sony introduced its Betamax videotape in 1975, with JVC a year later debuting the eventually widely-accepted VHS videocassette recorder. In 1979, Drum Corps International offered performances from the World Championships on videotape for the very first time. Since a dominant format had yet to be established, DCI offered recordings on four different kinds of videotape. New technology came with a price tag. All 12 finalist performances could be purchased in a six-volume set, with the least expensive VHS tapes costing fans a whopping $280. 6. 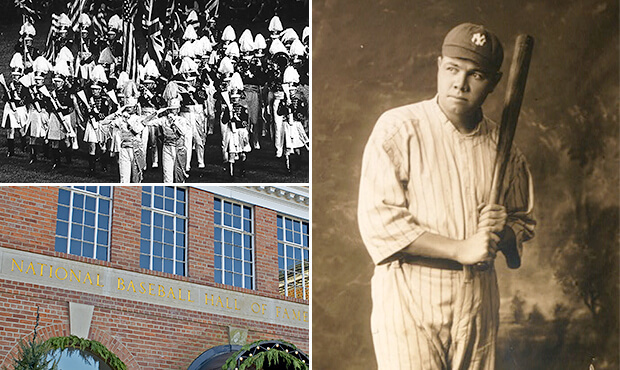 The Cadets were making music two years before the very first class of Baseball Hall of Fame members was selected. In 1936, Ty Cobb, Walter Johnson, Christy Mathewson, Honus Wagner and Babe Ruth were named as the very first class of inductees into the Baseball Hall of Fame. Two years earlier about three hours south of where the shrine to baseball's most notable players would eventually be located in Cooperstown, N.Y., a local Catholic church in Garfield, N.J. started the Holy Name Cadets. 7. The average price of a gallon of gas rose nearly 500 percent between the Blue Devils' first and most recent World Championship titles. Drum corps that on average travel 10,000 miles across the country certainly long for the days of sub-$1 gas prices to get them down the road each summer. The average price of a gallon of unleaded regular gas was $0.61 in 1976, the year of the Blue Devils' very first Championship title. That average jumped to $3.64 during the corps' 15th gold-medal campaign in 2012. 8. The Little Mermaid is a year older than the Jersey Surf. 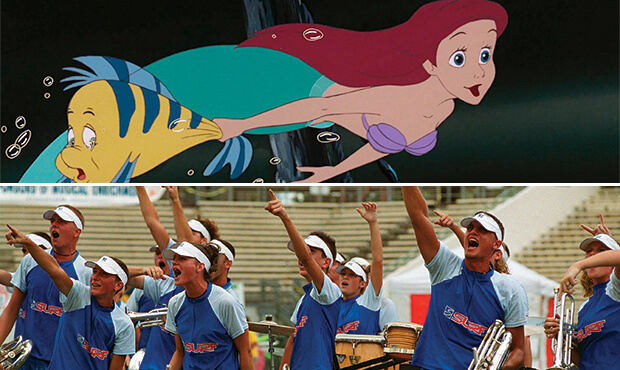 While Jersey Surf has been fielding an ensemble for nearly a quarter century, Walt Disney's "The Little Mermaid" has a year on the drum corps from the Jersey Shore. Earning more than $80 million at the box office during its initial release in November of 1989, the feature flick ushered in a resurgence of animated Disney movies the likes of "Beauty and the Beast," "Aladdin" and "The Lion King." 9. The Boston Crusaders were already getting ready to celebrate their 30th anniversary when the U.S. landed a man on the Moon. 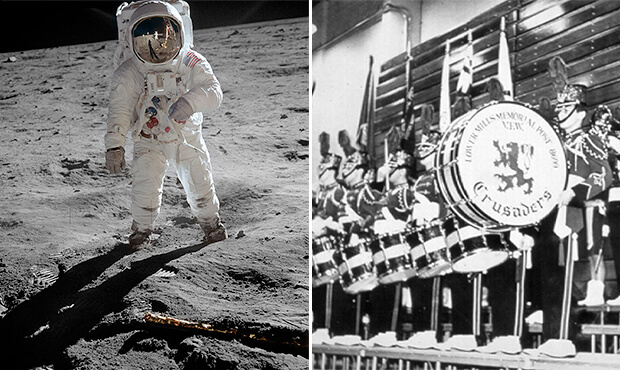 The third longest operating of Drum Corps International's World Class corps, the Boston Crusaders organization was just a year shy of 30 years old when astronaut Neil Armstrong made his "giant leap for mankind" in 1969. In 1961 President John F. Kennedy had declared, "I believe that this nation should commit itself to achieving the goal, before this decade is out, of landing a man on the moon and returning him safely to the earth." Interestingly, Boston Crusaders made him an honorary member in 1963. 10. 445 corps traveled to compete at the DCI World Championships before Sony introduced the Walkman. In 1979, Sony introduced the very first Walkman, a personal cassette player that made listening to music a completely personal and portable experience. Bus rides for corps members were forever changed. 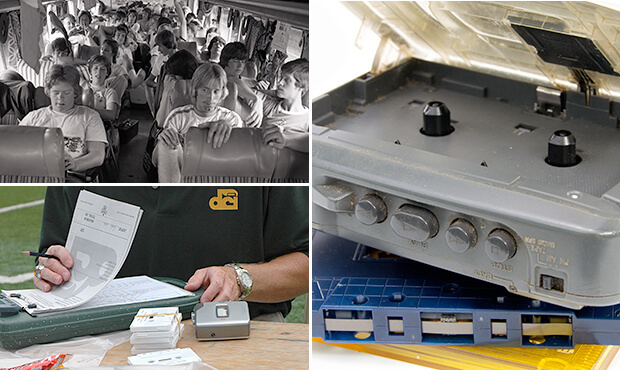 Even after cassette players fell out of use with the introduction of compact disc players and later MP3 players, the Walkman and related devices remained in service with drum corps into the late 2000s. Staff members used them to listen to tapes with commentary recorded by judges during performances. 11. As of 2014, corps members will all have been born in the age of the modern Internet. 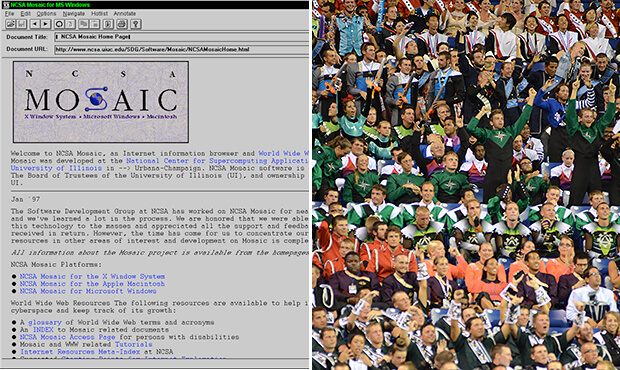 Developed at the University of Illinois and released in 1993, Mosaic became the forerunner to the web browsers we know and use today. With its ability to display text and graphics on a single page, Mosaic set the stage for a number of now common web browser features including sound, video, bookmarks, navigation buttons and more. 2014's age-out corps members—those who are at the 21-year-old maximum age to perform with a corps—were born in 1993. 12 must-hear sounds from the "Golden Age of Drum Corps"